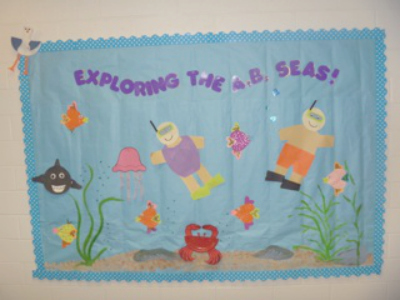 This bulletin board is a great way to showcase students’ ocean explorations. The patterns and instruction can be found in the Sea Animals Thematic Unit. Start by using blue paper to create a watery backdrop. There are many paper shades and textures to choose from. Large blue plastic tablecloths work well, too! Next, paint the sea floor beige or light brown. If you mix white glue into your paint students can sprinkle sand on the paint as it dries to create a more realistic look. Add green tissue paper seaweed or paint some right on the water! Add your sea birds, mammals, crustaceans, and fish projects as they are completed. Here are some ideas to start filling your ocean. You can have each student work on one sea creature, or slowly add them yourself. Seagull: Fold and unfold a small paper plate to create a line dividing the plate in half. Paint the back of the whole plate grey. (When folded over, the gray will form the gulls’ wings.) Draw two lines on the front of the plate (from the rim to the crease) to suggest the head and neck of the gull. Cut on the lines for the head and the neck and then bend the remaining “wings” down. Cut out yellow or orange legs and use markers to add eyes and beak. Shark: Paint a small plate gray and cut and add grey fins. Cut out a white mouth and eyes and use a black marker to draw teeth and add pupils to the eyes. Jellyfish: Use pink or blue paper or painted halves of paper plates for the jellyfish bodies. For the tentacles, add crepe paper streamers using tape, glue, or staples. Crab: Cut shiny red plates in half. To make eye stems, tape red chenille strips to the flat side of the plate. Glue eyes to the stems. Add legs and pinchers to each crab. Fish: Cut out five-inch hearts for the fish bodies, one-inch hearts for the fish mouths, and two-inch hearts for the fins. Add eyes and glitter for sparkly fish scales. Blue glitter-paint makes great fish bubbles, too. Divers: Create divers wearing bathing suits. Cut out diving masks and add smaller blue ovals on the masks. Glue eyes to the blue ovals and glue black rectangles to the masks to represent snorkels. Add flippers and the divers are ready to go!